This piece features a country style and has wooden knobs. It also features a stylish kick plate that creates an elegant and refined look.The one-drawer nightstand features metal slides. Ideal for kids of all ages, this nightstand requires a minimal amount of assembly.Country style. Wooden knobs. Metal drawer slides. Accessories not included. 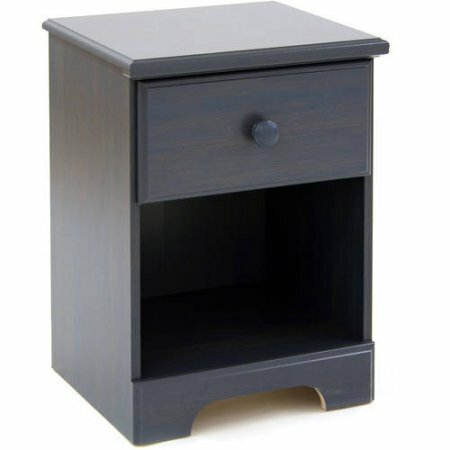 Material: Non-toxic laminated particleboard.Dimensions: 18"W x 16"D x 24"H. The ideal nightstand for children, teens or young adults. This piece features a country style and has wooden knobs. It also features a stylish kick plate that creates an elegant and refined look. The one-drawer nightstand features metal slides. Ideal for kids of all ages, this nightstand requires a minimal amount of assembly. Country style. Wooden knobs. Metal drawer slides. Accessories not included. Material: Non-toxic laminated particleboard. Dimensions: 18"W x 16"D x 24"H. The ideal nightstand for children, teens or young adults.